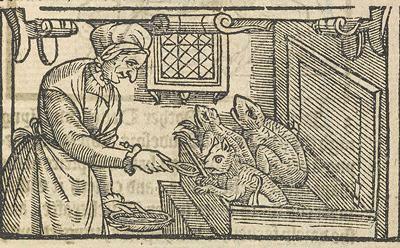 A woodcut illustration from a book published in 1579 of a witch feeding her 'familiars'. 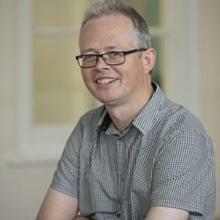 The fear of witchcraft was rife in Exeter in the late 16th and early 17th centuries, according to new research from the University of Southampton, which has revealed the extent of court cases and executions in the Devon city over a 100-year period. Historian Professor Mark Stoyle has discovered that Exeter was not only the last place in England where people were hanged for practising ‘dark arts’, but that these were just the last in a series of executions which may have begun as early as 1566. In fact, Exeter may have been one of the first places in the kingdom to sentence a witch to death. New evidence reveals that, between the accession of Elizabeth I in 1558 and the accession of Charles II in 1660, more than 20 local women and men were accused of being ‘witches’ or ‘sorcerers’, and denounced to the local magistrates. Many of these individuals were believed to possess ‘familiar spirits’: demons in the shape of small animals, like rats and toads, which unleashed their evil powers to ‘waste’ both livestock and humans on the witches’ behalf. 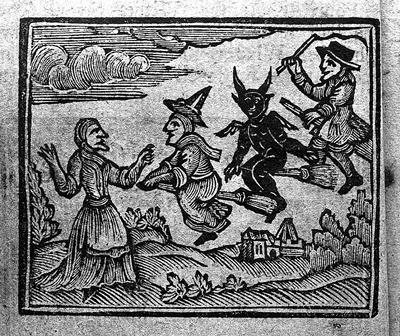 A woodcut of witches from an 18th century book. The deep roots of witch-belief in the city are revealed in a new book by Professor Stoyle, Witchcraft in Exeter: 1558-1660. Sourced from centuries-old court records, manuscript chronicles and registers of births, marriages and deaths, it charts the progress of each case of alleged ‘witchcraft’ from accusation to ultimate sentence. Among the cases highlighted is one which occurred soon after a Parliamentary statute of 1563 first decreed that those convicted of using ‘conjurations, enchantments and witchcrafts’ should suffer the death penalty. Two local women, Maud Park and Alice Mead, appeared before the city court in 1566 and were charged with causing death and physical injury through the exercise of ‘magic art’. Park and Mead were both found guilty, and although no record of their execution survives, if they did indeed fall victim to the noose – as seems all too likely – then they were among the first people in England to be executed for witchcraft following the passage of the statute. Further hangings of witches certainly took place in the city soon after this case. In 1585, for example, an Exeter woman named Thomasine Shorte was convicted of killing the entire family of an unfortunate local weaver through the exercise of the ‘black arts’ and was executed at the city gallows. Then, in 1609, an Exeter labourer named Richard Wilkyns was likewise hanged, after having been convicted of killing and hurting both people and livestock through witchcraft. Other cases discussed in the book include those of Mary Stone, an Exeter widow, who in 1620 was accused of killing chickens, infesting a household with lice and killing a man by bewitching him – causing him to fall from a field stile. She was also alleged to have commanded a familiar, in the shape of a rat, to spy on a woman and ‘do her harm’. Similarly accused of conspiring with familiars was Joan Baker, whom witnesses claimed kept toads in a pot and who was even seen with a toad sitting in her lap. It’s believed Stone somehow escaped a death sentence and continued to live among her suspicious neighbours. The fate of Baker, who appeared in court in 1653, is unknown. Professor Stoyle’s research provides numerous other individual stories of black magic, sorcery, curses and alleged murder which combine to tell an intriguing tale, shedding powerful new light on occult belief in Tudor and Stuart Exeter and on the dark, uneasy world of the urban ‘witch’.